There are many source code versioning tools. Some of them which I have previously used are perforce(p4), git, svn. There are more like cvs, mercurial and the list goes on.... In this post we will see how to install and configure mercurial. Configuration file for the same can be found in /etc/mercurial/hgrc. You can edit it to suit your requirements. Subversion, Git, Mercurial and others support three-way merges (combining mine, theirs, and the "base" revision) and support graphical tools to resolve conflicts. Which tool do we use ? In this post I will show how can we install KDiff3. It is an open source cross platform tool. Download the Kdiff3 tar file from the sourceforge repos, then extract the tar file. The sourceforge link for the Kdiff3 project. 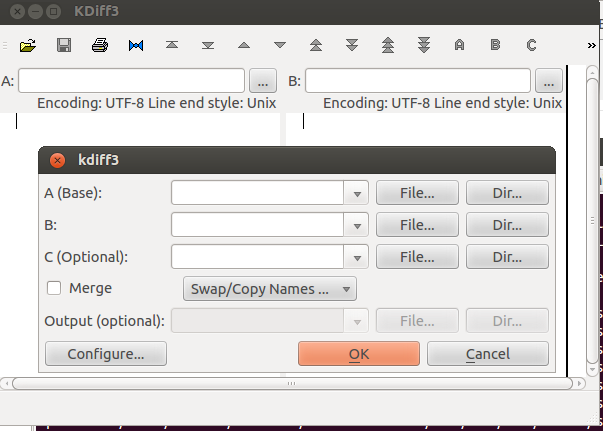 Now you should be able to launch the program by typing kdiff3 in the console.